Last weekend I was lucky enough to be invited to be on a two panels at the Western Canadian Music Awards in Moose Jaw, Sk. It was a blast, here’s what I remember. -People are super friendly in Moose Jaw. But, underneath, they don’t like people from Toronto. I kept this in mind constantly. -I bought the creepiest souvenir ever. Actually, I bought two. One has a home with my sister-in-law, the other is heading down to California to start a new life. -I won $22 at Casino Moose Jaw. Tiny place. Smooth Singapore Slings. R.I.P H.S.T. -I checked out the tour of Moose Jaw’s tunnels, the ‘Chicago Connection’. In the 1920’s, Moose Jaw was a bootlegging town during prohibition in the US, tunnels were built under the roads to hide these activities. It was rumored that Al Capone had an office there. Proof? Enough to create a tour, complete with actors dressed as flappers and gangsters. And animatronic bartenders…. read more here. -What made headlines while I was there? 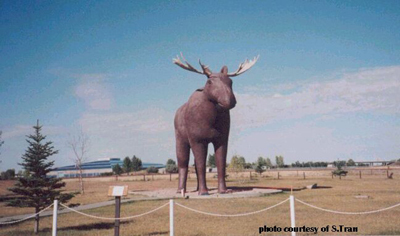 Mac the Moose (town Mascot and attraction) actually lost his jaw. No joke. I checked around. -The conference/festivals’ headquarters from Oct. 18th till the 21st was The Temple Gardens Hotel. They had a huge indoor/outdoor mineral bath. That was just what I needed Friday evening. I didn’t stay there though…. I (along with a bunch of the artists who were performing that weekend) stayed at the lovely theme hotel ‘Capone’s Hideaway’. It was exactly what I needed. A bed. -The showcases happened thursday through saturday night at 8 venues, all within 5 blocks of each other. It was easy to jump between bands. (Something you can’t really do at CMJ). -I’m still doing the work to listen to music by all the bands that I saw perform, but here’s a couple that made an impression on me.